DESCRIPTION Brilliant blue and black combination. 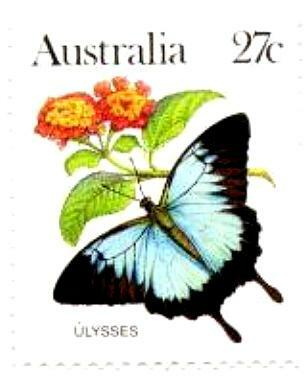 Our Australian butterfly Papilio ulysses is commonly known as the Dunk Island butterfly from Queensland ( Australia ). Various races of the species are found in # Indonesia, # Papua New Guinea, # the Solomons, as well as the subspecies joesa in northern Queensland Australia. 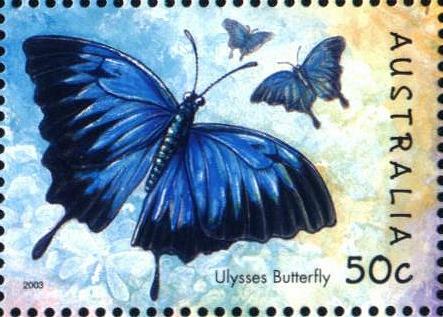 When perched, the iridescent blue is hidden by the still attractive but darker underwings. They often fly above or on the edge of the canopy, frequently along rivers and the side of the road, and are commonly attracted to gardens. As it opens and shuts its wings in flight, the flashing of it's bright blue can be seen from several hundred metres away. Its caterpillar feeds on the pretty 'Pink Evodia' tree that can be found along the roadsides. This Australian butterfly is the most popular framed butterfly we have in stock and great as a present for International visitors. It comes in a variety of frame variations.